Place fish in a nonreactive dish and season with salt and pepper. Pour the lime juice over the fish, cover with plastic wrap, and refrigerate for 1 hour. In an oven over moderate heat, heat the olive oil until hot, but not smoking. Add the onion, season with salt, cover, and sweat until translucent, about 2 minutes. Add the garlic and saut? briefly, and then add the tomatoes and more salt. Cover and cook until the tomatoes change color. Lower the heat and add the olives, capers, raisins, jalape?os, and bay leaves. Cover and simmer until the sauce thickens, about 10 to 15 minutes. Season with salt and pepper, remove the bay leaves, and keep warm until ready to serve. Huachinango or more aptly named Northern Red Snapper, is a species of snapper native to the Western Atlantic Ocean throughout the Gulf of Mexico and Caribbean Sea. It is one of the most delectable and popular fish throughout the Western United States, particularly Florida and Mexico. Huachinango is an excellent choice for sushi enthusiasts, so let us at Anderson Seafoods be your ideal online place to get the freshest Huachinango flown in daily from the warm Gulf of Mexico waters. Northern Red Snapper does share the similar body characteristics of other snapper types such as the mangrove snapper, mutton snapper, and dog snapper. They all share the sloped profile, medium to large scales, with a spiny dorsal fin. The light red, almost pink coloration is synonymous with the species, with the red darkening closer to the dorsal fin. The taste is a sweet to mild meld, with a distinct flavor. The meat is tender and when cooked, white and delicious. There are many different ways and recipes to prepare Huachinango, baking, sauté, deep fried, grilled. It is also the national dish of Veracruz, Huachinango a la Veracruz. Our Red Snapper (Huachinango) is flown in daily from the Gulf or Mexico and Florida. Each order comes in standard pack containing 2 fillets of about 8-10 ounces each with the skin on and bones out. Buying Fresh Seafood Online from Anderson Seafoods has never been so easy, or tasted so good! Looking where to buy Huachinango online? 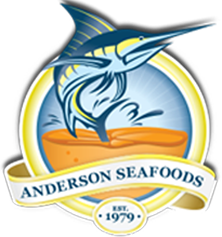 Anderson Seafoods brings the finest selection directly to your kitchen. Copyright © 2018 Anderson Seafood, Inc. All rights reserved.